A sorghum crop at Moree. THE SOUTHERN Queensland and northern New South Wales livestock feed sector is pinning hopes on a rain front delivering much-needed rain for thirsty sorghum crops. While barley markets were in turmoil through the early part of this week over China’s investigation into Australian pricing, conditions in eastern Australia improved by degrees as forecast rain delivered summer crop prospects boost, first in Central Queensland, and then in southern Queensland and the Namoi Valley. 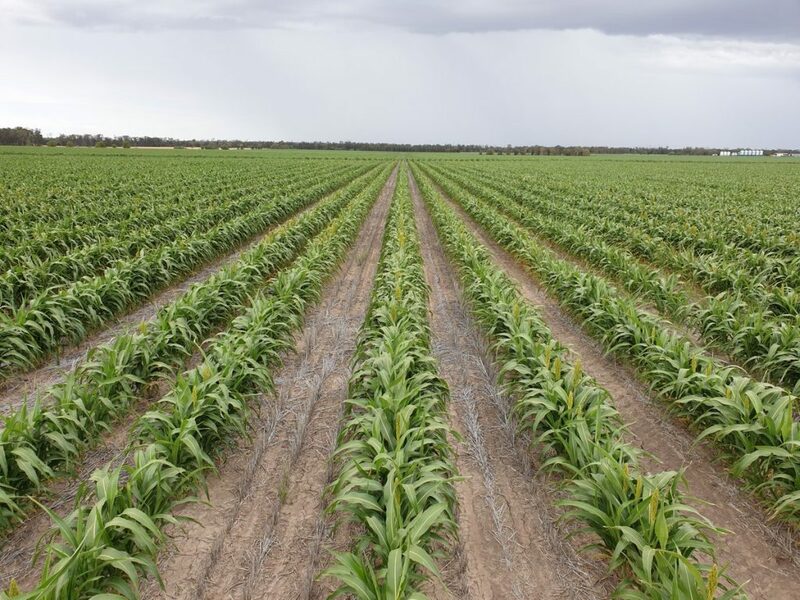 Significantly, Gunnedah’s rain total to Thursday morning of almost 70 millimetres has sealed the prospect of a sorghum plant in parts of the Liverpool Plains. “Southern Queensland still has a lot of fallow country that can be planted,” Advanta Seeds summer grains agronomist Trevor Philp said. Growers now would prefer to wait till closer to Christmas before planting more sorghum. Mr Philp said 60-70 per cent of potential sorghum area had been planted, and moisture profiles were an ongoing concern. “While there are still some decent yield prospects, southern Queensland has been through five years of rainfall deficiencies, and soil moisture profiles have slowly declined. “The better paddocks have half to three quarters full profile, but there is some sorghum planted on less than half. “The initial strikes have been good, and crops generally have come up well. “You don’t need a lot of rain to grow a decent crop of sorghum, but paddocks that were planted before that heatwave are just hanging in there, so timely rain is needed to get the secondary roots down and get those crops away. “Crops planted after the heatwave are starting to feel the pinch, and would be looking forward to follow-up rain as well. “In order to grow a big sorghum crop we need rain. Rain is still our limiting factor,” Moree-based ADM southern Queensland northern New South Wales grain accumulation manager, Peter Dorney, said. For the consumer, sorghum is the best prospect for a feedgrain which is cheaper than wheat or barley, neither of which is likely to show much price relief. The further inland WA wheat or barley is carted by road from Brisbane, the more competitive locally grown sorghum will become in the feed ration. While sorghum does not fit into the rations for feedlots over the next three months, Darling Downs-based cattle feedlot operator Australian Country Choice (ACC) is keeping close tabs on the timing of sorghum partially replacing wheat and barley. “Given the price relativities between wheat and sorghum, sorghum could start buying some demand into the feedlot rations,” ACC grain buyer, Brad Taylor, said. “Though there has been good volatility in sorghum over the last month, it’s not quite there yet. Sorghum availability would be a welcome change for the feedlots which would normally buy most of their grain locally, but their cheapest grain supply this year has been transhipped wheat and barley ex the port of Brisbane. The same Port of Brisbane supply line has been best-price bet for Mt Cotton poultry business Darwalla, which typically feeds both wheat and sorghum. Darwalla has also been weighing up lifting sorghum usage some months down the track. “Current wheat and sorghum replacement prices are too close to each other, but once you get into sorghum harvest period February through to March, April and May; it’s a no-brainer,” Darwalla general manager Gary Heidenreich said. “We started to put plans in place a month ago on a reduced wheat input, and we are running tests on aspects of feed quality such as pellet durability. Cargill northern regional manager, Matthew Pattison, pointed to differences in how decisions were made by a poultry grower and a beef feedlot operator. “The poultry consumer knows what their demand is for the next six months and can buy with more confidence, whereas the feedlot doesn’t know what the price of cattle will be in six weeks’ time, so will probably want to wait out the weather situation and see how it develops. Following the strong start to sorghum planting in southern Queensland and parts of northern NSW, Mr Pattison said some bearish factors could come to play on the grain. “If you add the combination of very high flat prices and the likelihood of seasonal conditions potentially improving, the risk-reward equation is swinging toward more planting rather than less. Price discovery in sorghum markets this year is muddied by higher-than-usual execution risk, through which counter-parties would have to price a significant risk premium in their forward trades. Barley prices have fallen last week in the wake of commencement of proceedings into alleged barley dumping by Australian companies into China, the impact of which can only augur poorly for Australia’s sorghum export prices to China’s feed sector. A trader said Australian barley today would quote at least US$50/t cheaper into China, an execution risk and price situation likely to quash even top-end baijiu sorghum trade with Chinese customers for the moment.